It’s not every day that the man in charge of Navy aviation gets to meet a “Frankenfighter,” but that happened on Sept. 17 at Fleet Readiness Center Southwest. Two decades ago, the depot on Naval Air Station North Island near San Diego likely would’ve scrapped a heavily damaged Hornet strike fighter already past its prime, but an ongoing readiness crisis in carrier aviation changed all that. Mechanics decided to try to salvage the mess by stitching two crumpled planes together and cannibalizing parts from a jigsaw puzzle of other junked jets. And Miller hates the very idea of cannibalizing planes for parts, much less a “Frankenfighter” that’s been fleshed out with borrowed bits of other jets. If there’s such a thing as an aircraft readiness war, Miller is leading the Navy’s charge; the repair depot is its center of gravity; and the “Frankenfighter” is its unknown soldier. Because it was pieced together, it doesn’t even have an identification number like every other military jet. How the Navy got so desperate for fighters that it would weld two wrecked Hornets together isn’t a mystery. Testimony by military leaders and multiple reports from federal watchdog agencies detail how 17 grinding years of air missions over Afghanistan ― then Iraq and Syria ― drastically hiked the hours airplanes operated, wearing them out along the way. When the first production F/A-18A Hornet flew in 1980, the Pentagon estimated it would spend about 6,000 hours in the air before joining the scrapyard. The wars and then long delays with the jet’s stealthy replacement ― the F-35C Lightning II joint strike fighter ― pushed the Navy to extend the lives of legacy Hornets to 10,000 flight hours. Then came deep defense spending cuts triggered by the so-called “Sequestration” deal in 2011 between Capitol Hill and the White House, slashing military maintenance budgets. Between 2011 and 2016 the Navy’s Hornet inventory slumped from 581 jets to 537. And it hasn’t been much better for other planes. Only half could even fly. A sobering September probe by the Government Accountability Office revealed similar problems with the Navy’s E-2C Hawkeye Early Warning and Control Aircraft, their E-2D replacements and the C-2A Greyhound Logistics Aircraft. By 2016, the typical Greyhound had flown for nearly three decades, piling up 10,117 hours. It suffered from worn out propeller systems and outer wing panels; a lack of depot and field maintenance personnel to repair them; and a shortage of parts because no one manufacturers the monoplanes anymore, according to GAO. The Navy plans to replace its 27 remaining Greyhounds with 38 new tiltrotor V-22 Ospreys but that won’t be completed until 2026. The Navy’s typical E-2C Hawkeye in 2016 was 16 years old, long past its planned service life. It still faces long delays inside repair depots, often because of an acute shortage of spare parts, GAO determined. On average only three years old, the E-2D Advanced Hawkeyes were experiencing faster failure rates than anticipated in 2016, largely because the avionics system proved too heavy for the airframe. While it’s still in production, the E-2D also is plagued by too few spare parts, forcing depots to scavenge from other Hawkeyes, GAO found. To learn how the service plans to fix its readiness woes, Navy Times followed the Air Boss to Reno, where carrier aviators at the Tailhook Association convention dish candidly every year about their challenges. In panel discussions and private powwows between Sept. 6 – 9, Miller and the rest of the brass passionately vowed to end the era of the cannibalized jet. They’re optimistic because the operational tempo in the Middle East and Afghanistan has waned. Federal funds are flowing again to the Navy’s depleted maintenance coffers. And now Air Boss has a free hand to remedy aviation’s woes. But it all starts with money. Overall Navy spending on all operations and maintenance is poised to reach $48.9 billion next year, $3.6 billion more than in 2018, according to a bill already passed by the House of Representatives and Senate. Their legislation earmarks roughly $1.25 billion for the Navy’s aircraft repair depots next year, $338 million more than lawmakers supplied in 2016. About $644 million will go to airframe work, a jump of more than $155 million compared to what the Navy requested in 2106. Engine maintenance will fetch $110 million more than in 2016. And spending on aircraft components is expected to rise to $45 million next year, $13 million more than in 2016. The man with the shovel is the Air Boss, Miller. “Bullet owns the recovery plan,” said Vice Adm. Bill Lescher, the Navy’s maestro at integrating capabilities and resources. In June, Vice Chief of Naval Operations Adm. William F. Moran fired off a Navy-wide memorandum reminding senior commanders that Air Boss will direct the resources to recover aviation readiness. It’s not that Miller boasts more power than the seven previous Air Bosses, but he can bring more funding and staff attention to bear on the crisis. Bullet’s battle plan tackles the Super Hornet fleet first by extending the service lives of its oldest frames, revamping at least 40 fighters annually, initially focusing on the worst jets. But he doesn’t want to stop there. Miller and other leaders at Tailhook said that deeper changes are needed throughout Navy aviation to make sure readiness gains don’t erode. At the helm of Naval Air Systems Command, Vice Adm. Dean Peters wants the service to better screen parts being designed long before they get bolted to a plane. Similar to Wal-Mart’s “just-in-time” delivery system, ongoing Navy efforts help to prevent overstocked parts but Peters believes the future might be 3D printing, with depots fabricating widgets on the spot instead of waiting for factories to make them. Depots print more than 100 types of parts now but they also need more manpower on shop floors for other repairs. Rear Adm. Michael Zarkowski, head of the Navy’s Fleet Readiness Centers, told Tailhook aviators that he’s hiring more than 1,100 skilled workers, logisticians and engineers to mend aircraft. The Navy has launched apprenticeship programs at three depots and will spend $230 million to revamp equipment and facilities nationwide. Two years ago, Zarkowski’s repair shops fixed 450 aircraft of all types. That number climbed to 485 last year. It should hit 500 this year and 510 in 2019, he said. To help clear the backlog of seriously damaged or worn out aircraft, all West Coast fighter squadrons want to lean more on the new Naval Aviation Maintenance Center of Excellence at California’s Naval Air Station Lemoore. The base’s 16 fighter squadrons already haul their long-term “down” jets here, freeing maintainers to focus on planes in their hangars. Lemoore’s replacement squadron once averaged between five to seven “up” aircraft out of 63, Miller said. By reconfiguring the squadron’s size, pushing problem planes to the Center and having enough parts available for repairs, pilots now have at least 20 jets ready to fly every month, according to Miller. A special center for the East Coast is being planned to replicate the reforms. Bullet’s plan calls for 341 Super Hornets to be ready to “fight tonight” at any given time. 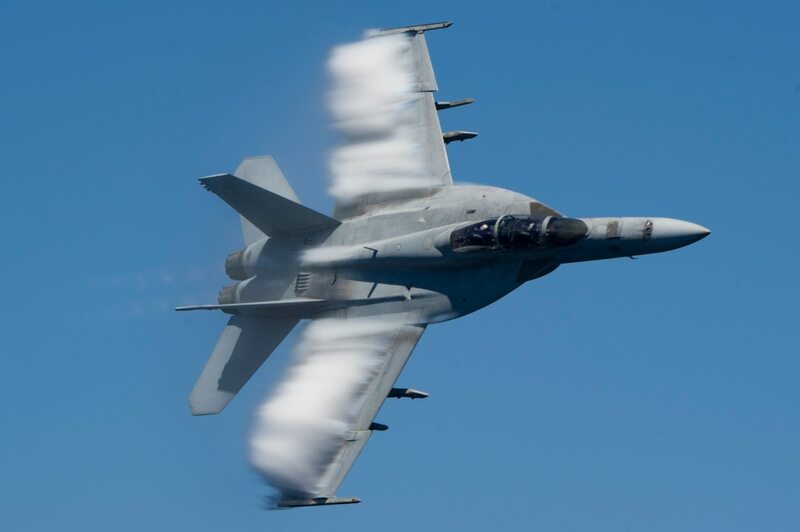 Despite the Navy staying “laser focused” on the Super Hornet fleet, however, the dismal numbers Shoemaker shared on Capitol Hill remain “essentially unchanged,” Naval Air Forces spokesman Flanders said. That number stood at 280 recently before plummeting to 266, but officials remain bullish on Bullet’s blueprint. “You can’t watch this like the Dow Jones or you’ll drive yourself crazy looking at the numbers back and forth,” Naval Air Systems Command’s Peters said. But those reforms better work because even Secretary of Defense Jim Mattis concedes he doesn’t know how long the Navy has to fix the readiness crisis before Congressional funding dries up. On the Brink of Disaster: Can Congress Save the U.S. Military?